Time for an Auro update! This past month has been incredibly huge for this game – probably one of the most productive months on record, largely because I reached a threshold in learning to program that has allowed me to really start contributing on the code side (not just the game design, music, sound, writing, and web stuff sides). I’ll put this one in sort of a list-like format, just to spice stuff up. Here we go! First of all, you can go check out the new Beta Updates thread over here to find out exactly what’s been going on, down to the nitty-gritty detail. In this post, I’ll just mention some of the big stuff. I single handedly, with my own two hands programmed the entirety of the PLAY MODE metagame. You can now win and lose games which add or subtract from a big green XP bar. If you win more games, you level up. As you level up, the game gets harder. If you’re up to the Hard Mode levels, losing makes you lose XP. Even cooler: there’s a placement match when you first start, so that if you’re already good when the game comes out (as many of our beta testers already are), the game will automatically advance you to a higher skill level so that you don’t have to grind through the easier modes. There’s also a Custom Games screen which allows players to “free play” an un-ranked game on any difficulty mode. In the Custom Games screen you can also play MADNESS MODE, which has crazy, unfair and outrageous monster generation. You might face a level full of a dozen Slimes, or 3Yetis and 3 Troggles, or 20 rats. It’s unfair, unranked, and unpredictable! The game now keeps track of all kinds of records, like wins and losses, highest scores on various modes, and more. I mostly implemented a system of NOTES that will appear throughout the game. Think of notes as kinda like “loading screen texts” – little 2-3 sentence long ditties that give you some bit of lore, a tip, or some other strange thing. You can collect these, and the game keeps track of how many you’ve found. Tons of balancing on the Easy, Normal and Hard modes. Can’t wait to get a new version out to testers to see what they think. Oh, I also created a new commercial site for Auro – check it out at http://www.auro-game.com. Yes, I’ve switched from the all-caps AURO to Auro. I think it’s better that way; AURO looks like it’s an acronym for something. Also we have a subtitle now – “Auro: A Tactical Bumping Game” is the full title. What do you think? So them’s the updates. Things are generally happening on-schedule and I’m feeling good about getting this game out before the summer comes. With PLAY MODE basically 100% done, all that’s left to do is some story mode tweaks, bug fixes, and polish. Experienced developers are probably going, “oh is that ALL? !” sarcastically. I know that’s a lot, but we’ve now got three programmers on the job, so I’m pretty optimistic. – Is “reading” really a thing, or no? As well as some lighter stuff, like this PC/Console/Web game recommendation thread and this iOS/Android game recommendation thread. Anyway, I’m posting about it because we’d love to have some more members. Please consider stopping by and inviting some friends. Oh, and as always, feel free to sign up for the Auro Beta in the Getting Started section of the Auro forum. AURO Update Feb 2014! Winning! 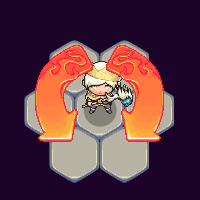 Auro Update for May 2014 – Super Crunch Mode! Thanks for coiitrbutnng. It’s helped me understand the issues.